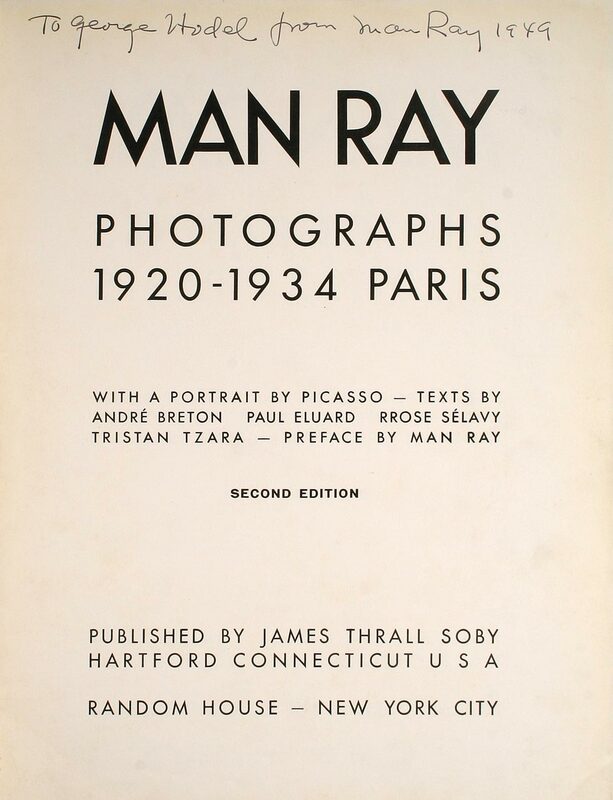 The Detroit News has published an article on book dealer John K. King, who is offering “Man Ray: Photographs 1920-1934 Paris” inscribed by Man Ray to Dr. George Hodel. The book sold Sept. 14, 2006, for $4,600 in an auction by PBA Galleries. Solve this as a jigsaw puzzle. The Detroit News article fudges some important facts. The hefty prices for even unsigned copies and the 1934 print date both refer to the very rare FIRST edition of this book. As the frontispiece you posted clearly shows, this copy is from the second edition. I think Mr. King probably overpaid, unless he is hoping for a buyer named Steve Hodel. I'm wondering why the signature is dated 1949, but the card inside is dated 1948? Even w/out that discrepancy, I'm skeptical about this story. That's a good question. The card says 1948, though. Here's a link to the image (note that the gallery has watermarked it, so I won't post it). In answer to Brooke's question, Man Ray had batches of these greeting cards made up each year: some original art of his, the inscription "Greetings From Juliet and Man Ray", and the year. It looks to me like he simply gave George Hodel one of the previous year's leftovers. The book itself may have been something of a leftover as well, not to mention being a transparently self-promoting sort of gift. Not that I'm knocking it. The man had a living to make, and in those days he was counting his pennies. But I wonder how many more of Man Ray's "close personal friends" received the exact same gift. To yfmrc: your theory is much less sinister-& probably more plausible-than mine. I was wondering if the guy who's now selling this book w/the card inside had perhaps purchased them separately & affixed the card inside himself. I'm too cynical, I guess. Also, thanks for the puzzles, Larry. I hate to describe anything involving the Dahlia case as 'fun', but they were.